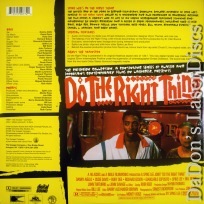 Do the Right Thing 1989 - 120 min. - Color Genre: Drama Rated R Country: USA LaserDisc Movie Storyline: Spike Lee's racial and political filmmaking bent is given the full treatment with this simmering expos LaserDisc Movie Review: Director Spike Lee dives head-first into a maelstrom of racial and social ills, using as his springboard the hottest day of the year on one block in Brooklyn, NY. Three businesses dominate the block: a storefront radio station, where a smooth-talkin' deejay (Samuel L. Jackson) spins the platters that matter; a convenience store owned by a Korean couple; and Sal's Famous Pizzeria, the only white-operated business in the neighborhood. Sal (Danny Aiello) serves up slices with his two sons, genial Vito (Richard Edson) and angry, racist Pino (John Turturro). Sal has one black employee, Mookie (Spike Lee), who wants to "get paid" but lacks ambition. His sister Jade (Joie Lee, Spike's sister), who has a greater sense of purpose and a "real" job, wants Mookie to start dealing with his responsibilities, most notably his son with girlfriend Tina (Rosie Perez). Two of Mookie's best friends are Radio Raheem (Bill Nunn), a monolith of a man who rarely speaks, preferring to blast Public Enemy's rap song Fight The Power on his massive boom box; and Buggin' Out (Giancarlo Esposito), nicknamed for his coke-bottle glasses and habit of losing his cool. When Buggin' Out notes that Sal's "Wall of Fame," a photo gallery of famous Italian-Americans, includes no people of color, he eventually demands a neighborhood boycott, on a day when tensions are already running high, that incurs tragic consequences. 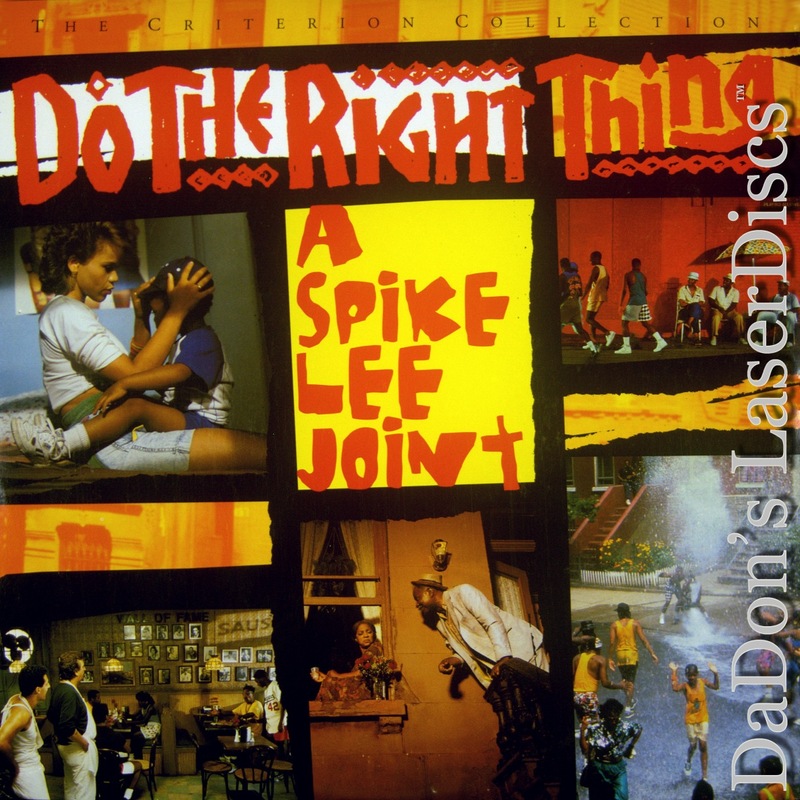 --- Mark Deming Provoking both substantial praise and fierce criticism for its "inflammatory" content, Spike Lee's Do the Right Thing (1989) examined racism in all its complexity, eschewing simple answers for an ambiguous, artistically ambitious mosaic. The action is confined to one Brooklyn block on the hottest day of the summer, and the Bedford-Stuyvesant location thus becomes a multi-racial and multi-ethnic microcosm, spanning all ages and character types. The tapestry of incidents, whether humorous, intimate, or increasingly hostile, becomes a means to articulate a wide range of attitudes and beliefs, bolstered by cinematographer Ernest Dickerson's contrasting "hot" and "cool" colors and Lee's stylistic breaks from traditional narrative, such as direct address to the camera. Sal's Pizzeria may be the central site of confrontation, but it isn't just a matter of black vs. white. The final quotes from Malcolm X and Martin Luther King, Jr. offer differing views about racism and violence, punctuating a film that at all points questions what is the "right thing" and never offers a clear or simple answer. Funded by Universal after School Daze's success in 1988, Do the Right Thing premiered to acclaim at the Cannes Film Festival that was matched in the U.S. despite unfounded trepidation that it would provoke violence. 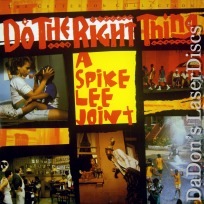 Considered one of the few great American films made in the 1980s (although it was largely ignored by the Oscars), Do the Right Thing confirmed Lee as one of the preeminent filmmakers to emerge from the decade, while its box office success helped galvanize a new wave of 1990s African-American cinema. --- Lucia Bozzola Thanks for Visiting DaDon's Rare LaserDiscs ! Reviews, Articles, Newsletter and Information for Movies on LaserDisc LD Laser Disc, LazerDisc.